Award-Winning thriller writer [and former political journalist] Joe Finder’s latest work is his most elegant and page turning. It is also a perfect reflection [as well as deeply prescient] of our own political paranoia, and how it has seeped into our society with the ever advancement of technology. When a CEO of a Boston Coffee organisation, Michael Tanner inadvertently picks up the wrong lap-top while traversing US Transportation security at LAX, his life takes a turn for the worse. It appears the lap-top he mistook belongs to the powerful US Senator Susan Robbins. In most cases this would not be a problem as one could contact the authorities and the lap-tops could be switched back; except there is a problem. It appears that the Politician’s lap-top is her personal one, and in a serious breach of protocol, she had downloaded top secret US Government files onto the Mac. If Robbins’s lap-top falls into the wrong hands, it could pose a serious security risk to America [and potentially other countries], as well as spelling the end of a promising political career. With terse and concise chapters, there is a seeping dread that striates the narrative, as not only is Tanner’s life now under threat, but the threat also looms large over his family. We read of miss-placed USB sticks, insecure passwords; we read of classified government emails on private servers, of foreign government interference in elections and referendum campaigns – but most recently we have come to understand that not all the bad guys wear black, as some wear white. The level of detail within the story, technical as well as political is extraordinary and as ever Finder does not allow the research and his insider-knowledge get in the way of the story; albeit being a nervous excursion into how advancing technology and human nature will battle onwards. 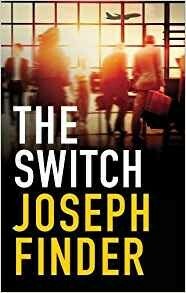 Like Fentanyl, this thriller should come with a health warning, as like that synthetic opioid, The Switch is as addictive as it is anxiety-inducing as it details our lives in the digital age.